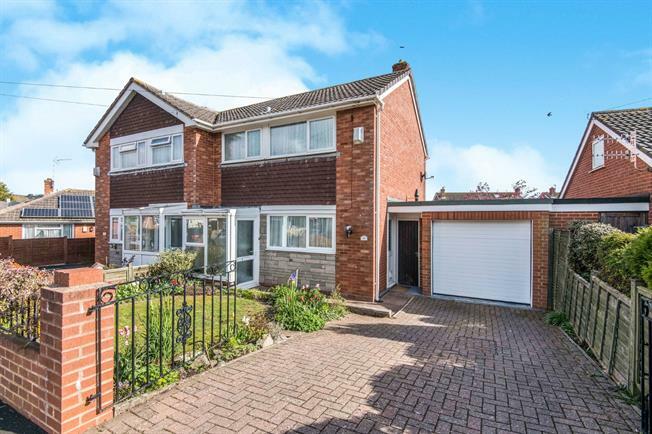 3 Bedroom Semi Detached House For Sale in Exeter for Offers in excess of £270,000. An early viewing is highly recommended to make the most of this well presented property situated in a sought after area. Accommodation to the ground floor comprises kitchen and large lounge/dining area which provides direct access to the rear garden. To the first floor you will find three bedrooms and a modern family bathroom. The property is double glazed and gas centrally heated through out and benefits from a garage, garden and driveway. To the front of the property you will find a beautifully presented token front garden, driveway and garage. The garage is accessed via an electric door and provides enough space for one car as well as a workshop area to the rear. The garage also provides light and power. Aa modern fitted kitchen comprising a range of matching wall and base units with a roll top work surface and tiled splash backs. Integrated washing machine, fridge and freezer. Stainless steel sink with drainer and mixer tap over. UPVC double glazed window to the front aspect. Integrated electric double oven. Four ring electric hob with extractor over. Vinyl flooring. UPVC double glazed door providing access to the side of the property. A light and spacious lounge with enough space for dining. Carpeted flooring. Radiators. Electric fire. UPVC double glazed window to the rear aspect and UPVC double glazed doors providing direct access to the rear garden. UPVC double glazed window to the rear aspect over looking the garden. Carpeted flooring, radiator. UPVC double glazed window to the rear aspect, carpeted flooring, radiator. A white and modern three piece suite comprising low level WC, vanity style hand wash basin and double shower cubicle. UPVC obscure double glazed window the front aspect. Carpeted flooring. Tiled surround. Heated towel rail. A well maintained and fully enclosed garden laid to lawn with a patio area which is the perfect area for alfresco dining during the summer months. Green house. Summer house. Raised flower beds comprising a range of mature shrubs and bushes. Pond.